Happy birthday, Pumpkin! To mark this, your seventh birthday, I made you a cake. 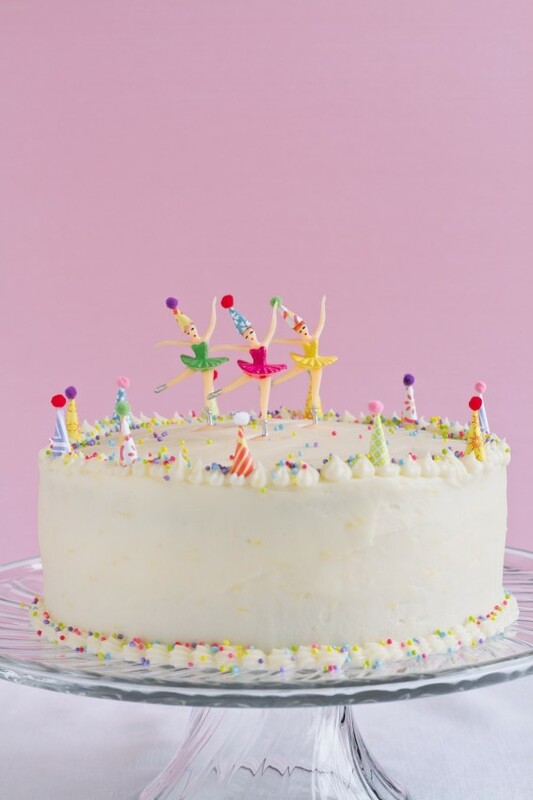 A cake topped with lots of teeny-tiny things. Because teeny-tiny things are the bestest. For example, kittens are teeny-tiny and way awesome. So were you when you were born. Also, rats holding teddy bears. And pixie portals. Good things come in teeny-tiny packages. 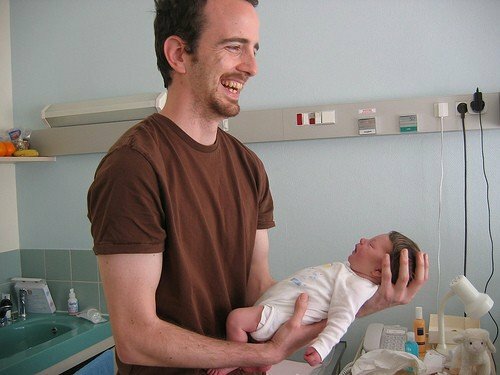 I’m guessing you’re old enough to hear a few teeny-tiny things about your father (my brother) now. Some things that might help you understand why he is… the way he is. First off, as a child, your dad had an imaginary friend named Peter Wife. No, not White. Peter’s last name was Wife. It caused a lot of confusion, because everyone thought your dad was saying Peter White, when he was actually saying Peter Wife. Your dad would get super irritated about the confusion, but in fairness, I think he was feeling some heat from Peter. Anyhoo, Pete spent some time with us at a rental cottage one summer, and I believe he moved there permanently (along with your dad’s sense of humour about the whole thing) in the early 1980’s. So, the next time your dad is staring off into space, give him a little hug. He’s probably missing Peter Wife. Second, your Aunt Haddy and I used to call your dad Dumbo. Like, for a long time. (Years.) It made him pretty self conscious, so maybe get him a dvd of Dumbo for Christmas. Third, your dad was hit in the face with a garage door when he was little. It basically knocked his front teeth out. So, when he does really embarrassing stuff, assume that has something to do with it. He ain’t right in the head. Finally, your dad is pretty cool. He knows a crapload of stuff about junk most people couldn’t care less about. I hope it will serve you well one day. Or, at the very least, fill in any awkward silences at the dinner table. So, sweet girl, I made this cake for you because it’s a one bowl cake. That means it’s easy to make, even if you’re only seven years old. (Maybe Dumbo could help you out.) Also: lemon buttercream. 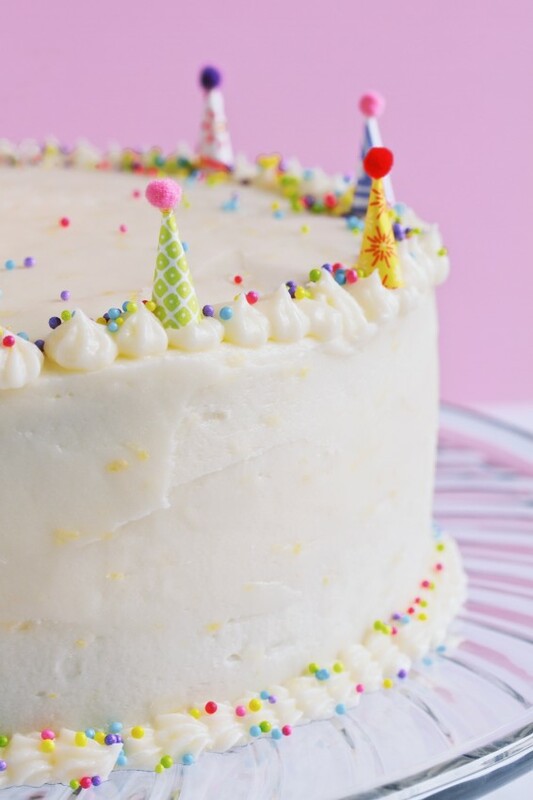 Because lemons taste fresh and springy, and buttercreams are perfect for making birthday cakes look extra special. 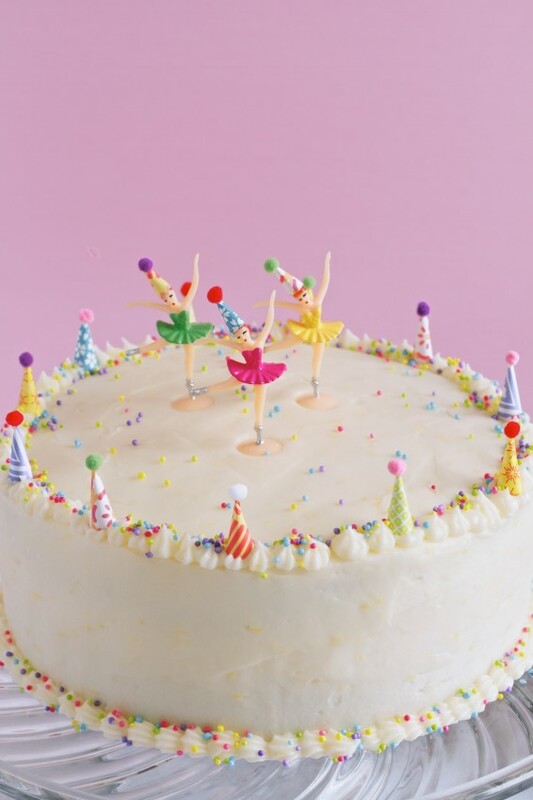 I made you some teeny-tiny party hats, because they are way cute (like you), and then customized some ballerina toppers to match the teeny-tiny sprinkles. And for today, I’m going to overlook the fact that you’ve opted for taekwondo lessons over ballet. Yields two 8-inch circular cakes. Mise en place – begin by getting organized. Read through the entire recipe before beginning. Measure out all of your ingredients. Preheat oven to 350°F. Grease two 8-inch circular baking pans and line with parchment paper. Sift the cake flour into the bowl of your stand mixer fitted with the paddle attachment (or a large bowl if using a hand mixer). Add the sugar, baking powder and salt, and mix for about 30 seconds on low speed to combine. Add in the butter and mix for about 2 minutes on low, until it’s incorporated, and no large lumps remain. Add the milk and vanilla, mixing on low speed to blend the ingredients, and then on medium speed for about 1 minute. Scrape the bottom and sides of the bowl well. Add the eggs and beat for about 1 minute on medium-low speed. Scrape the bottom and sides of the bowl well. Mix for an additional 10 seconds to ensure no lumps remain. Divide/spread the batter evenly between the two prepared pans (a kitchen scale is handy for this), and then smooth the tops a little with a spatula or bowl scraper. Bake for about 20-30 minutes, or until a toothpick inserted into the centre of the cakes comes out clean. The tops will be slightly golden, and the edges may pull away slightly from the pans. Allow to cool for about 10 minutes and then remove from pans to cool completely on wire racks. Yields enough to crumb coat and frost a two layer 8-inch cake with minimal embellishments. Cream the butter and cream cheese in the bowl of a stand mixer fitted with a paddle attachment (or in a large bowl with a hand mixer) until light and floofy (3-5 minutes). Sift 2 cups of the icing sugar into the bowl and add the salt. Blend on lowest speed to bring the ingredients together and then increase speed to medium, mixing until well combined. Sift the remaining 2 cups of icing sugar into the bowl. Add the lemon zest and lemon juice, and mix on low speed to bring the ingredients together, and then on medium speed until well combined. Add the heavy cream and beat until well combined, light and floofy. Adorable, adorable, adorable! I love everything about this post and wish I had an aunt who would explain my father to me. He’s one of my favorite people in all the world, but sometimes, just sometimes, an explanation would be so helpful. Happy, happy birthday to the wee martial arts student. Be consoled that at least she’s learning some graceful moves. And she can’t help but love her aunt dearly. A beautiful cake and tales about her father. What else could a 7 yr. old possible want. You, my dear are a good sister, ad a great aunt. Oh, and you are funny as ol’ heck. Aw, thanks!! 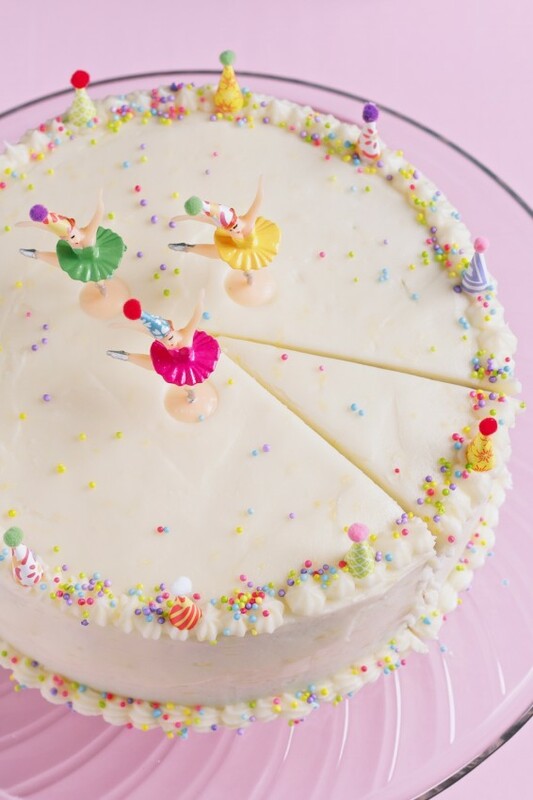 I must say, girly cakes are my most favourite! Another teeny-tiny thing: ebola. Not cute or cuddly at all (despite this). Why settle for ebola when you could have herpes? If you drop enough hints, maybe someone you know could give you herpes for your birthday. Good point. Also, fire ants. Teeny-tiny bastards. I know u think ur funny….but daughters ( children)should have good memories about their Fathers (parents), not mean, demeaning garbage that somehow makes u seem cool and funny. I have 2 brothers, and I would never dream of saying the kind of things you just wrote in a public format or to a child’s face just so I could be cute. Maybe the comments aren’t true…but my thought is, if that’s true, can’t u do better than that? Anyway…I like ur food I just can’t stand u! If you read through the vast majority of comments on this site, you’ll find that most people come here for a laugh or two, and leave comments that reflect the generally happy place this is meant to be. I have a writing style which might not appeal to you. Like maybe you don’t get wit. Or sarcasm. Or jokes. Totally okay! But I’d also encourage you to… you know… get a sense of humour. This blog isn’t your toilet. Please stop shitting all over it. Oh honey, it’s called teasing. It’s in the joke family. An insult is what you said. Though I’m sure your brothers appreciate that you only insult strangers in a public format, never family. Wow. Talk about toxic!! “Anyway… I like ur food I just can’t stand u”???? I’ll ignore the horrendous spelling, grammar and punctuation (or lack of) in your message, and just tell you this: Movita is awesome. Obviously you don’t get her humor. 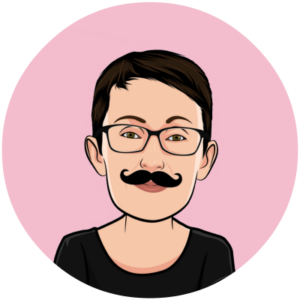 There are many of us who have been here since before she started focusing on food – her blog was basically a way to communicate to family members. It was and is an honor to come into her private circle. Now – she’s become world reknown and famous, and I hear, she even has an iPhone. How cool is that? But if you don’t get her humor, you don’t have to stay. Just keep your insulting, mean, judgemental attitude with you while you leave. And Movita, I love this recipe. My birthday is tomorrow – April 7 – and I’m so very sick. I’m loaded up wthi antibiotics, cough medicine and chicken soup. If I have the strength, I might just make this for myself. As Movita’s mother, I can tell you that no big (5year old) sister loved and cared for her baby brother as much as Movita did when her new sibling arrived. Her anecdotes are relayed with a great deal of affection. A sense of humour and the ability to lighten up and laugh are great tools to possess as you journey through life. wow. fortunate for me (and undoubtedly for Movita, patron saint of joy-makers) comments like yours are seldom seen. Sadly, urtoo, you are a prime example of living up (or down) to one’s name. Even sadder, you chose it. Clearly this is a case of you not “getting” Movita’s humor, which is of course okay – but not getting a joke, a tease, is one thing. Hurling intentionally hurtful insults of your own as a response is quite another. One adult response to not liking what you hear or read is to simply turn and walk away. You might find (if you try it) a little more peace in that. Truly, wishing you joy on your journey…. Unsolicited mean-spirited criticism + the liberal use of “u” = troll. I echo what Lynne B. and Movita’s sister said. I’ve always been curious as to what type of personality one must have to go out of their way to insult someone they don’t even know. That’s several minutes out of your day right there: wouldn’t you rather be doing something positive and productive with your time? For example, right now, I’m using MY minutes to defend my friend – though she’s certainly intelligent and strong enough to defend herself – because that’s putting something positive and encouraging into the world. If you have friends, maybe that would be a better way to spend your time. Also, “you” isn’t super hard to type, and shouldn’t be replaced with “u.” That only ever worked for Prince. I can’t believe someone would leave a comment like this on a child’s birthday post. You are the mean and demeaning one, and clearly unable to decipher tone, wit and humour. Shame on you. A beautiful cake. Thank you. Pick me, pick me!!! I love cake (especially with ice cream – the combination of flavors and texture makes life worthwhile). I hang around in my pj’s all the time. This is super cute. Your brother sounds like me as a stupid kid. Wow!! This cake is so beautiful!! And it looks absolutely delicious! 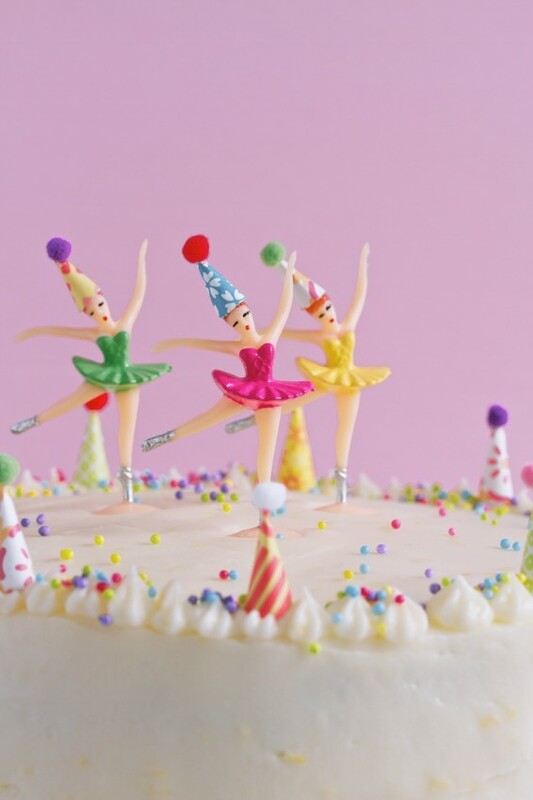 And those little ballerinas are soooo cute!! And your blog is so lovely!! 🙂 Very pretty! Thanks, Cailee! No scarves or hair bows, but I’m glad you like it just the same!! HAHA! You are both delightfully hilarious and a wonderful baker. I can’t get over the adorable little cake toppers. So cute. I have SO many things to say but I’ll do my best to keep it short. I love your sense of humour and my brother, best known in our family as Mossy Face, would get it too. Taekwondo instead of ballet? Oh Pumpkin! Sprinkles. Please share the technique of getting those darned things to stay in one spot? Yours are so neat and I’d have to put mine on with tweezers to get a job like this. I’m glad this is your blog written in your voice for those who love you. Maureen, let’s talk sprinkle application. First, my buttercream was nice and soft when I did the piping. That helped with the stickiness required to grab those wee sprinkles. Also, I sprinkled the tiniest pinches – just a teeny-tiny bit at a time. And finally – and this is most important – I’ve come to accept that bare feet cannot cross our kitchen. Because there are so many freakin’ sprinkles all over the place. And sprinkles kinda hurt when you step on them. My bucket list is getting longer and longer. Maybe I’ll just hand a few tasks off to you? A toast to imaginary friends…..whoever and whatever they may be! I have often wondered where imaginary friends go when they are no longer living with you. Thank you for clearing that up, Movita. An imaginary friend retirement cabin in Canada sounds delightful. It warms my heart to think of Peter Wife enjoying the company of my childhood imaginary parrots (Goggy, Janjo, Ovool, and Blue) and my daughters friends, Wowie and Pappi (who may have been cats…I am not sure…she “carried” them around on her shoulders for a year or two). I think living with “abusive” sisters and the garage door incident may explain your brother’s delusions of Peter. Neither my daughter, nor I, had a close encounter with a garage door. We are also both oldest children, so no “abusive” siblings at the times our delusions occurred. No explaining it. 🙂 By the way, lemon is the perfect flavor for such a delicately pretty cake. Tiny martial arts figures would have totally ruined it. Happy 7th birthday to Pumpkin! I kinda want to move in with Pete and his new friends. The cake is gorgeous and your niece is so lucky to have you in her life! Also, I love the way you describe your relationship with your brother, it is hilarious and genuinely sweet. Boo to all the trolls and your response was well written. So much adorableness! I think you’ve really hit the nail on the head, here. Adorable things come in tiny packages. When you make them bigger, the amount of cute dissipates rapidly. Also, you’re niece is incredibly lucky to have someone in her life to tell her these things about her dad. 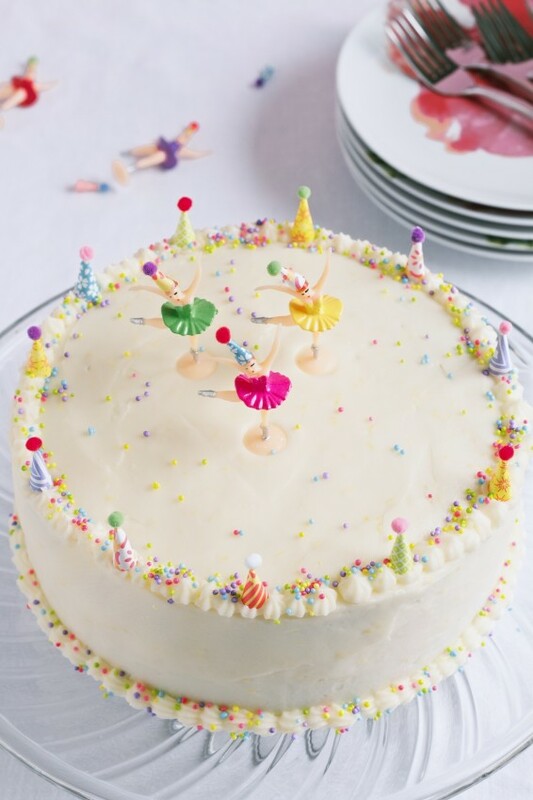 And make her the most adorable party-hatted cake ever. I’m a wee bit jealous. I derive way too much pleasure from how they incite anger and raised hackles in others. I’m giggling right now, a horrible slow little giggle. Does that make me evillll? I like this cute girly cake too, so I can’t be all bad. Also I think the sad tale of your brother’s fake friend has finally made me realize that your brother is real. Three cheers for Peter Wife. Let’s hear more about him. Life is about balance, Emma. That’s why I often write about poop AND cake in the same blog post. 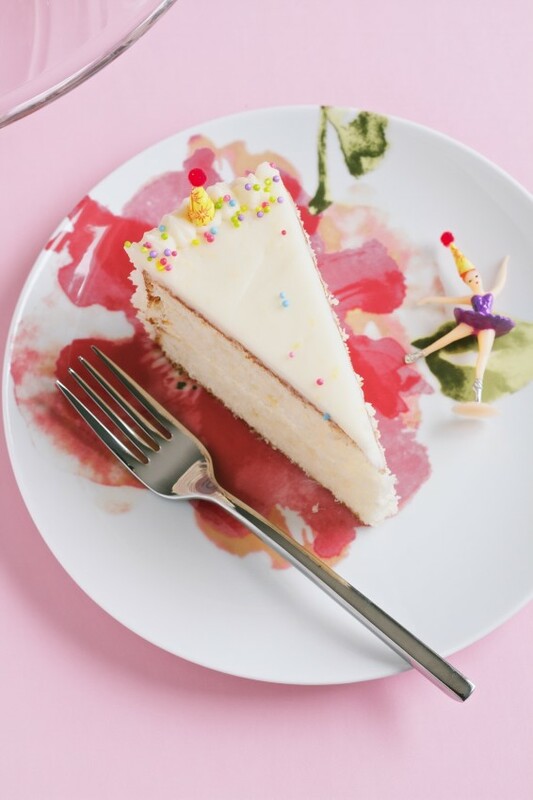 Here you are welcome to laugh at blog drama and ogle pretty cake at the same time. Life is good. Amazing! You know when you get rude comments like the one above, you’ve truly made it in the blogging world! You’re a nobody until you’ve unleashed somebody’s crazy. You keep being you, Movita, because we all love you! And I love this cake. It is so freaking gorgeous, I’m gonna hurl from jealousy (because my layer cakes look the opposite of this). I’m on a search for the best yellow cake so I gotta add this to the collection of recipes I’ve amassed. RIGHT? I feel like Martha Stewart! People LOVE to hate HER! Also, I’m always searching for the perfect white cake, and I hear the whiteout cake from Baked is amazing. In fact, I believe Shannon blogged about it. I’ve gotta get on that! Aw, that’s what I like to hear! Favoritism due to awesomeness – from one awesome person to another, hahaha!! Not feeling well at all. Went to my local grocery store (five minute walk – figured I could handle it) to buy a teeny tiny cake for myself since part of my sense of taste came back. Really was doing an excellent Zombie from Hell imitation wandering around the isles there – couldn’t decide which beautiful cake to buy. We are very lucky as a small, local bakery makes the cakes & pastries there. Anyway, this was too big a decision for me so I decided I needed to do my Zombie-Walk a bit more. Picked up a few more things that I so didn’t need, paid for them & left. Then remembered when I was outside my apt door that I forgot to buy my cake. No matter!! I’m make Movita’s easy one bowl lemon cake! This was getting to be too much like work for my birthday. Hell, just walking to & from the store was more work than I was up for. So I went to bed instead & slept for hours. Just as a testament to your awesomeness, Movita, I have to share this. When my daughter was pregnant with my soon to be first granddaughter, Josie, she asked me for name suggestions. I tried to convince her that Movita was it. I’m really surprised your daughter didn’t go with Movita. Has she READ MY BLOG? Hahahaha – no, I don’t think she has. To be fair, *if* she did, I know she’d totally love you.. and all her time is taken up with baby (now toddler) time. Happy Birthday to Pumpkin! That’s like the holy grail of cakes in this house: yellow plus lemon (plus one-bowl, which is always welcome, considering the messes i tend to make). It’s beautiful, and you know i love tiny things, which means those hats are my favorite. i wonder if tiny hats could be easter-appropriate? sure they could be. Those hats are appropriate for all occasions. Love you, your cakes, your take on the world, and your way with words. That dancer said mean things about me. And then paid the ultimate price. Okay, first off, I am late to the party, (at my dad’s, no interwebs at the “old” man’s ranch, lots of really cute baby calves though . . . sorry back to the point), beautiful cake, rude people and I was scrolling down to comment on the ballerina carnage and Ironwoodfarm beat me to it! I just knew you had thrown in some “taekwando ninja” taking out the girly ballerina with one CHOP on the leg . . . but alas, it was a party hat! You are a rock star in our house where good natured meanness abounds. Have a good one! Doesn’t she know that ballerinas get to wear pretty, frilly, things and girls who do Taekwondo get to wear men’s pajamas? That is the cutest of cakes! And I agree that good things often come in tiny packages. I love that the tiny party hats are exactly tiny ballerina-head-sized. 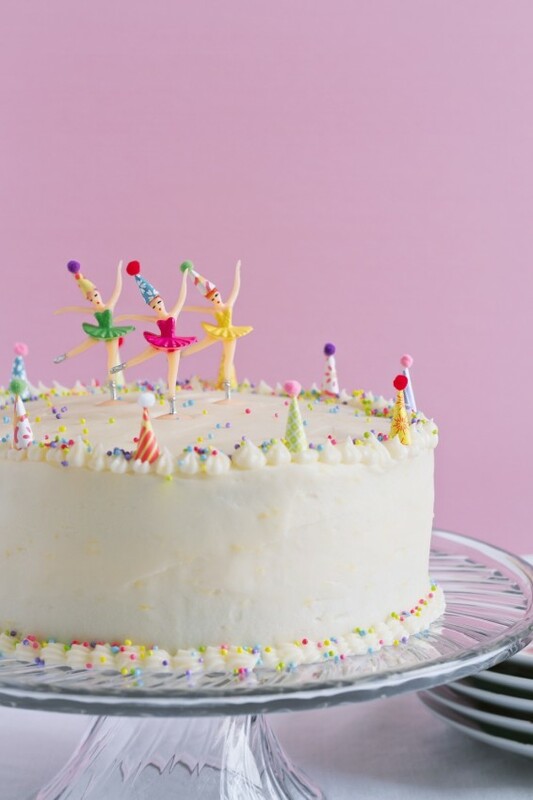 Love everything about this…the story, the cake, the frosting, the itty bitty ballerina toppers, and most of all….the obvious love you have for your brother and your niece. I’ve made these twice now. In the span of about a week. And I might just have to whip up another batch because they are absolute perfection. I LOVE your recipes and blog and was crushed to find you weren’t blogging for a while, but I commend your decision to do so, given your reasons. I’ve been taking baking courses at our college in Toronto and make many of your recipes and use your techniques. I’m getting my daily MB fix by following you on Facebook and Instagram. I’ve had some trouble with this yellow cake and wonder if you can help. I’m glad you’ve reposted it because it is just delicious. The flavour is PERFECT. The buttermilk just makes it and I love it. But, it’s not holding together well. I make a few cakes a week so am not new to the cake rodeo. I can’t get this one to hold together well when I ice it nor when I cut into it. I’ve made it a few times now. I wonder if there may be a typo with either the flour or the baking powder? Maybe it needs another egg? I know you’re not blogging anymore and may not be responding. But if you come across this, I’d love a reply. Hi Diana! Thanks for your sweet comment! I’ve just checked the ingredients, and there are no typos. It is tender cake – which is probably why it tastes so good. It’s very old school! I often freeze my cakes before decorating, as it makes them more stable, which might be why I haven’t had trouble stacking/cutting this cake. Though, that said, I’ve made and decorated this recipe in the past without freezing and didn’t have any trouble! The only thing I can think of is bake time – maybe you’ve underbaked? Somehow I doubt this given your experience though. As you can see in the photos up above, my version held up well when cut. GAH! I wish I could be more helpful! Because I posted this a year ago, I can’t remember if the cake was chilled when I cut it. That certainly would have made for clean cuts, but that’s only a guess! (I always serve at room temperature as I hate cold cake.) So… that wasn’t the most helpful, was it? I do lean toward very tender cakes, and they do tend to be less forgiving than pound cakes! They are more tricky in terms of stacking and decorating, but I’d rather have tender and tasty than stable and dry! Comments on this post are now closed as it was published in April 2014. Thanks for stopping by!